I’ve been cycling to work in London, a few times each week and 16km each way, since 2012. For about half the year, that means riding through the dark, and so I’ve become the proud owner of a large number of LED bike lights. 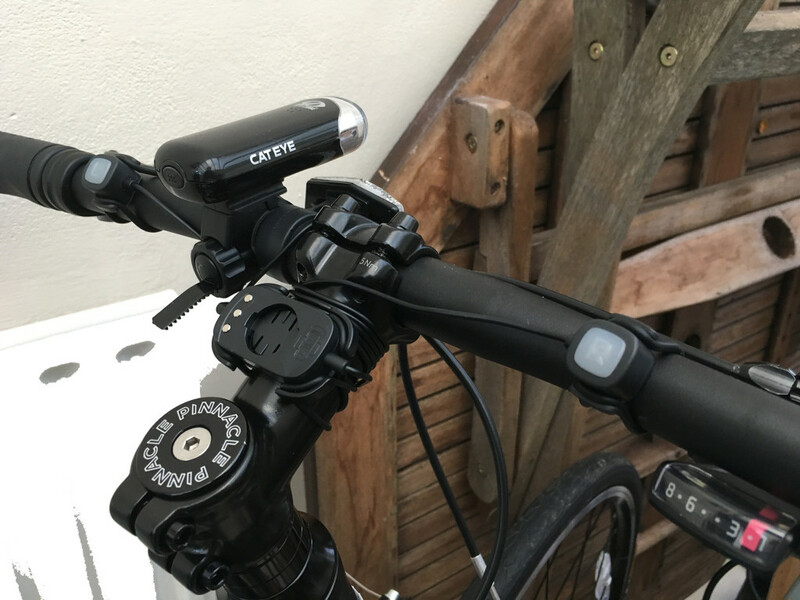 As well as lights front and back, I’ve taken to wearing both front (a Lezyne spotlight-type) and back (an old CatEye held on with plastic tags) lights on my bike helmet in order to present a larger shape to cars coming up quickly. 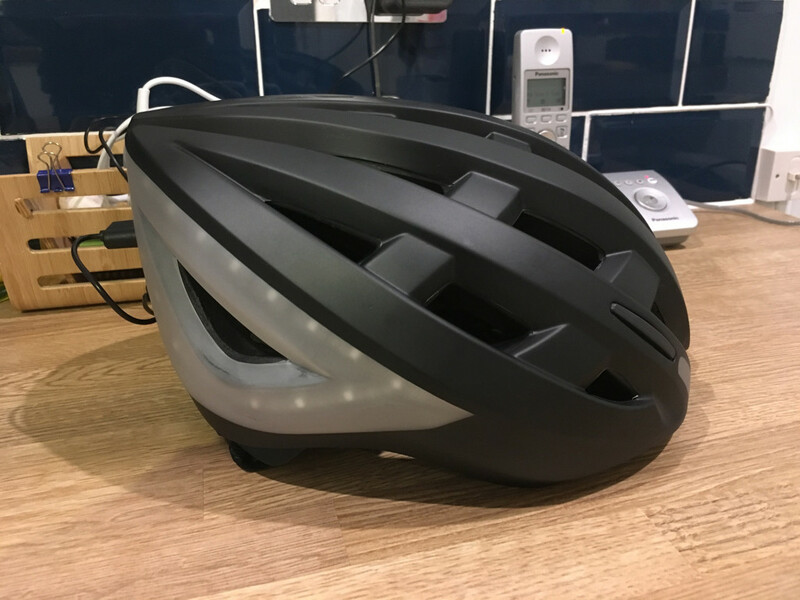 In July 2015 I heard, via press release, about a forthcoming Kickstarter for the Lumos Helmet – a bike helmet with integrated lights, including a brake signal and turn indicators. I backed it, and last week the finished product arrived. As the company is now taking more orders, I thought I’d jot down a few thoughts based on my experience so far – and then update this at the end of winter with a proper conclusion based on several months of use. There’s a photo with the lights on at the top of the post, and I’ve put a video of the lights in use further down. My first impressions are generally positive. The helmet looks and feels well made, and the harness – which has a tightening wheel at the back – is reasonably comfortable. It feels a bit odd to me right now, but that’s probably because I’ve used the same old helmet (a Giro Savant) for five years. One thing I’ve noticed is that on the Giro there’s a lock at the point where the straps divide on each side (the middle of the Y shape, if you see what I mean), but on the Lumos there isn’t – this makes forward/back adjustment a bit more fiddly. With a battery and electronics inside, the helmet weighs a bit more than usual – I make it around 450g compared to 250g for my Giro. It’s early days, but at the moment I notice that I’m wearing it – this might well pass. (click for full size) which are handy, although the charge percentage does sometimes vary (turn it off at 75, it comes back on at >90). 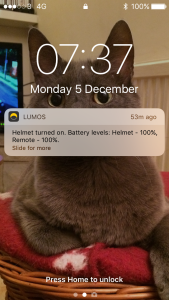 My daily commute – 45mins each way with the lights flashing – seems to drain about 30% of the helmet battery, and put barely a dent in the remote’s charge. The lighting has three modes: solid light, slow flashing and fast flashing, which cycle by tapping the power button. A long press turns the helmet off. The indicators are push for on, push again for off, and there’s a fairly loud beep from the helmet when they are activated, so you know the remote control signal has been received. Sorry about the rustling; it’s unusual to shoot videos wearing full Gore-tex cycling gear. 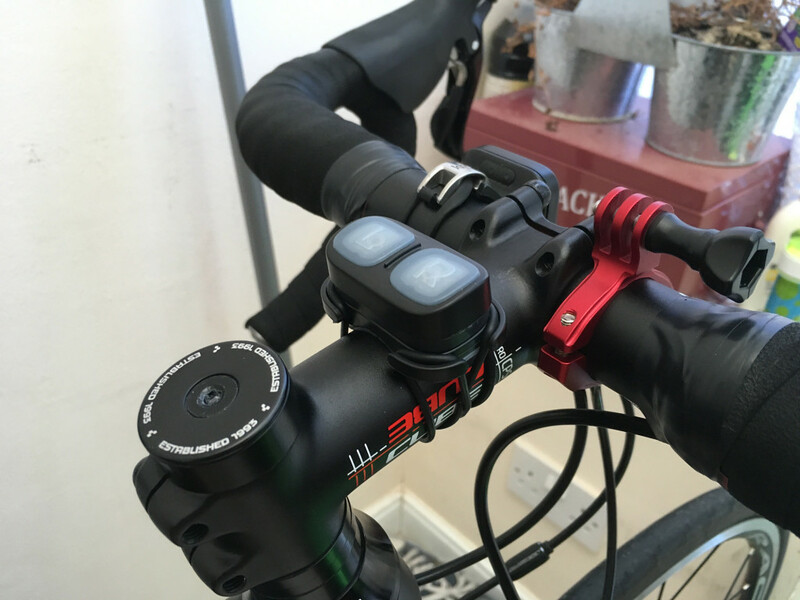 One thing to note is that the automatic brake light feature, as promised by the Kickstarter, is currently “beta” and disabled by default – I haven’t enabled it, as there’s no way for me to tell if it’s working properly or not, and for now I’m quite happy with the bright, flashing rear light. As for a verdict: well, I don’t think it’s possible to properly judge the Lumos until I’ve used it for at least a few months of winter, and through some torrential rain – I will update this review when that’s the case. For the moment: it feels well made, seems to work as it should, and the remote in particular is better than I’d hoped. At the current price of $179 (about £140) it feels a little bit expensive; although my usual helmet costs £40 and you could easily spend the same again on lights, that’s still another £60 or so to add the indicators and convenience. So as promised, an update. It’s now April, the clocks have changed, and all my commutes are in daylight again – the roughest months of winter seem long gone. 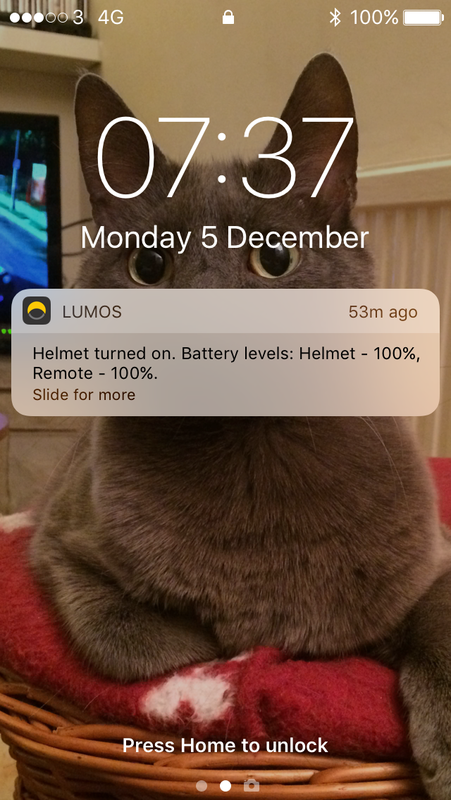 And I used the Lumos through all of them, on regular commutes into London and also dozens of rides to the nursery with my son. The good news is that everything important still works. The Lumos survived rain, sleet and snow with no sign of damage to any part of it, and despite being repeatedly fixed and removed the remote hasn’t jumped off the handlebars into the road, which was something I feared. The battery proved good – charging once or twice a week worked for me, and it only ran flat on one occasion when I forgot (I kept another light on the bike, so this was no big deal). The slightly less good news is that all my initial concerns still hold. The harness isn’t great, and needs constantly adjusting to stay fitted (the Giro one, for comparison, is solid as a rock). The app proved an unreliable way to keep track of the battery, as power on/off alerts often don’t work. And, crucially, the helmet is still just that little bit heavy – not so heavy that I disliked wearing it, but heavy enough that, now the sun’s up, I’ve been happy to pick up my old Giro helmet again for the summer. That said – I’m still a satisfied customer. The Lumos does what I hoped it would, and does it very well for a first generation product – with a few tweaks the next version could be brilliant. And I’ll be packing mine away for September as the evenings draw in again.